Offering you a complete choice of products which include dancing fountains. Enriched with vast industrial experience, we have been able to offer innovative dancing fountains. In these fountains the combination of sprinkle of water and lightening patterns are combined in such a way which creates an eye-catching effects as water sprinkles are dancing. 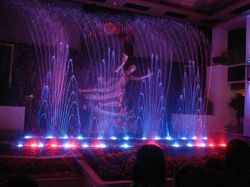 The lightening effects and water sprinkles are automatically controlled with a set time interval. With the availability in diverse patterns, these dancing fountains are very easy to maintain. Looking for Dancing Fountains ?